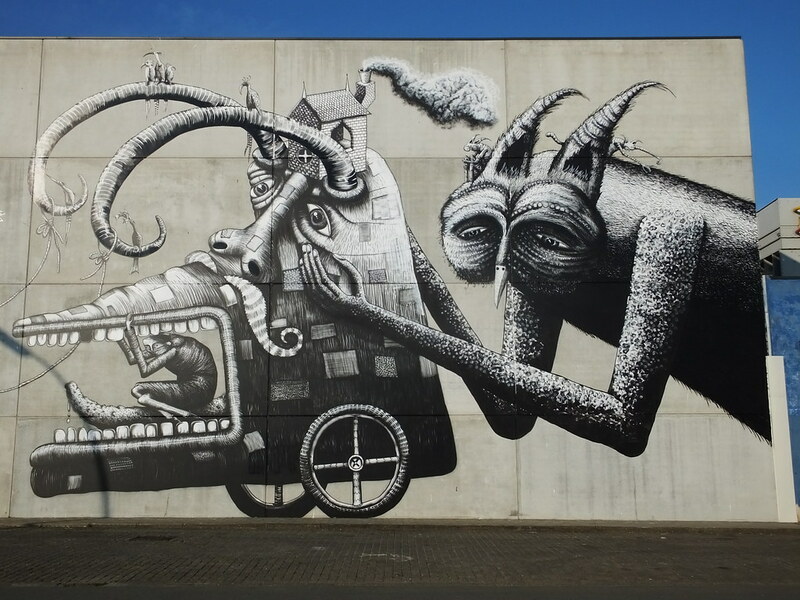 Welsh cartoonist and illustrator Phlegm was invited to take part in Belgium’s premier street art event held yearly in Ostend. 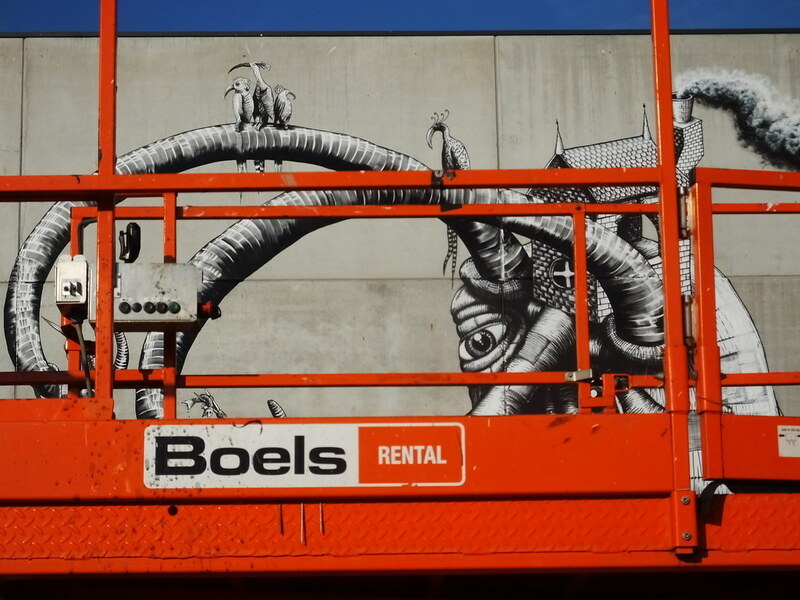 The Crystal Ship took place during the first week of the Belgian Easter holidays (3-8th April 2017) where over twenty international street artists attended including big names like Axel Void, Alexis Diaz, Juane and C215. 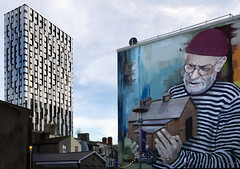 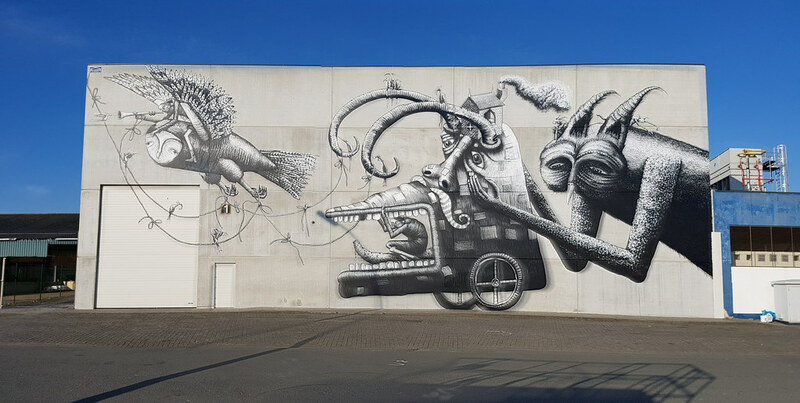 Phlegm’s huge wall was located at Victorialaan – an area in the middle of the dockside area of the busy and largest maritime city in Belgium. 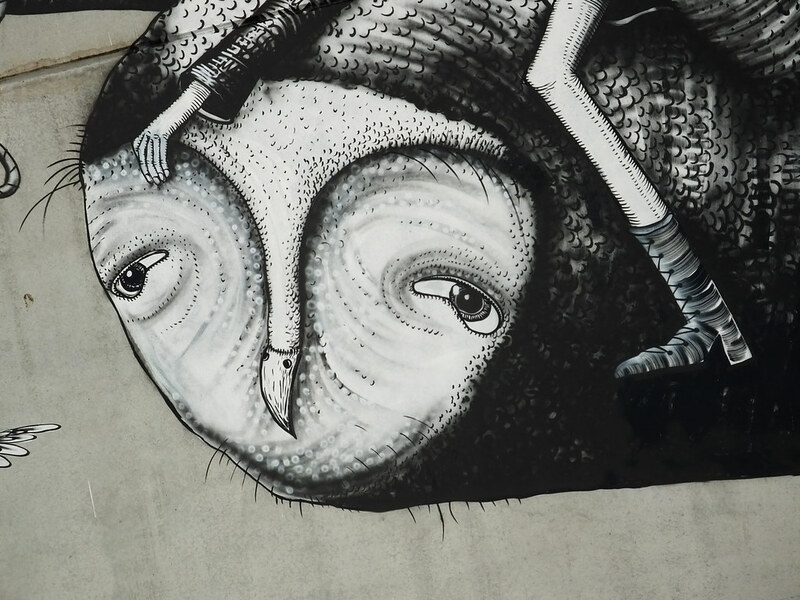 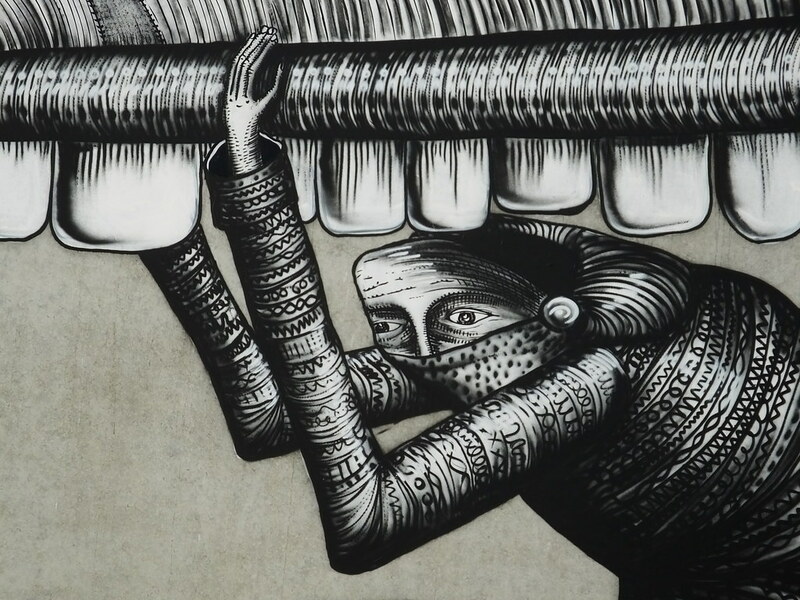 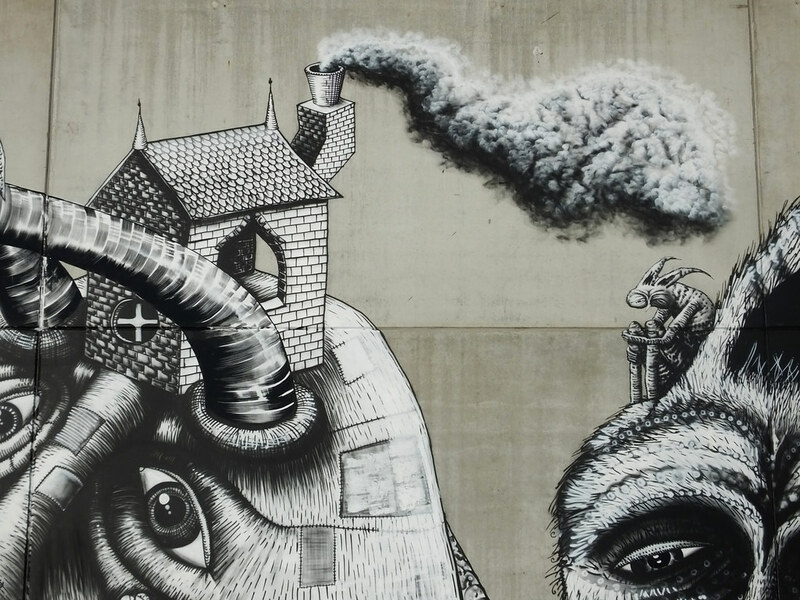 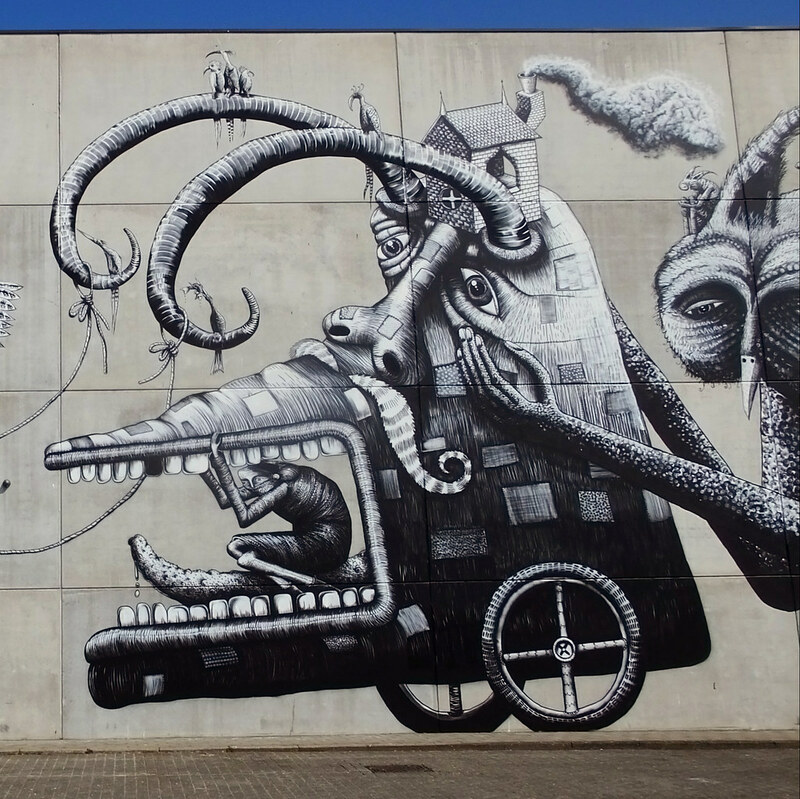 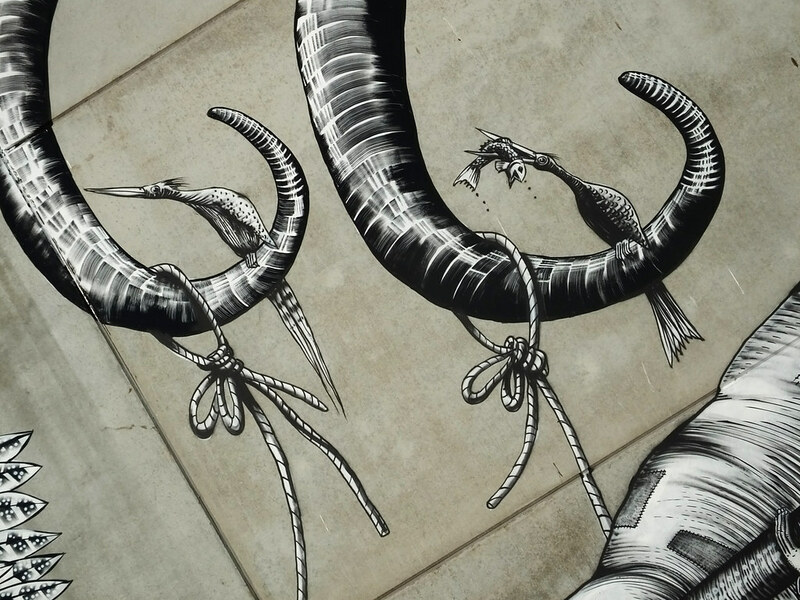 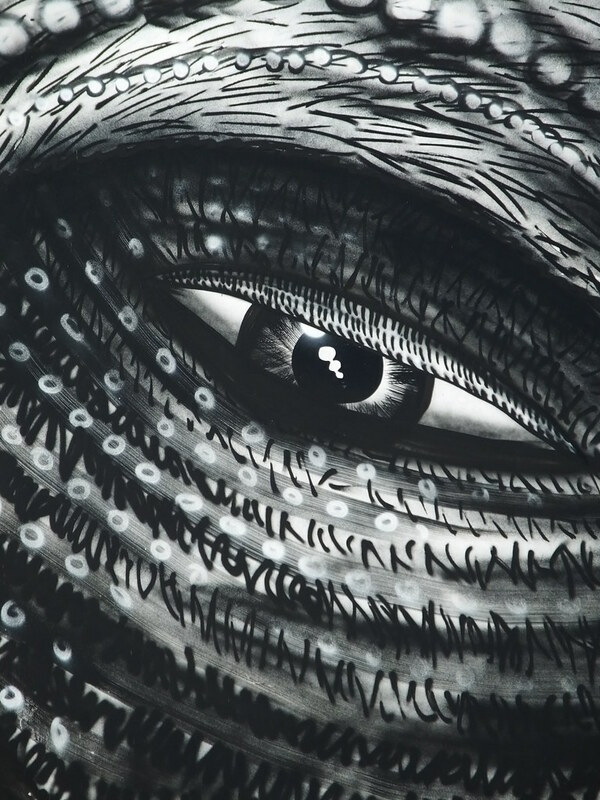 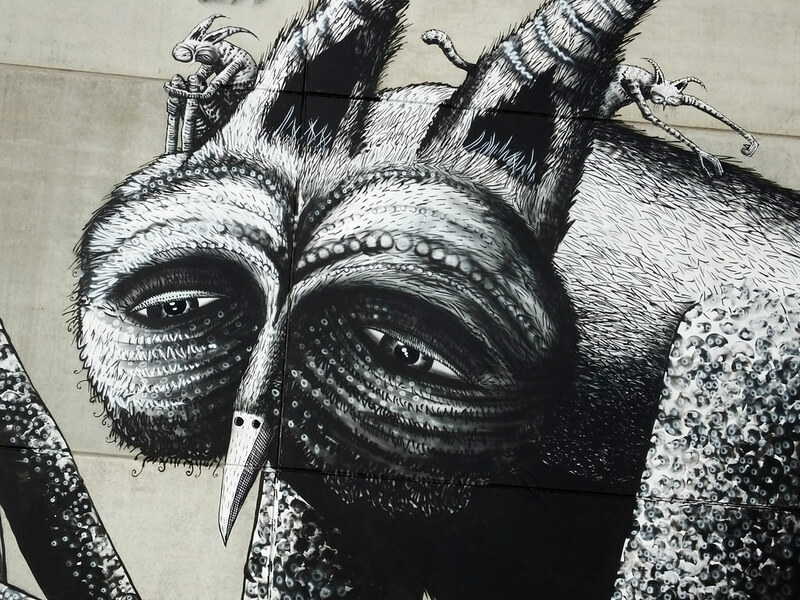 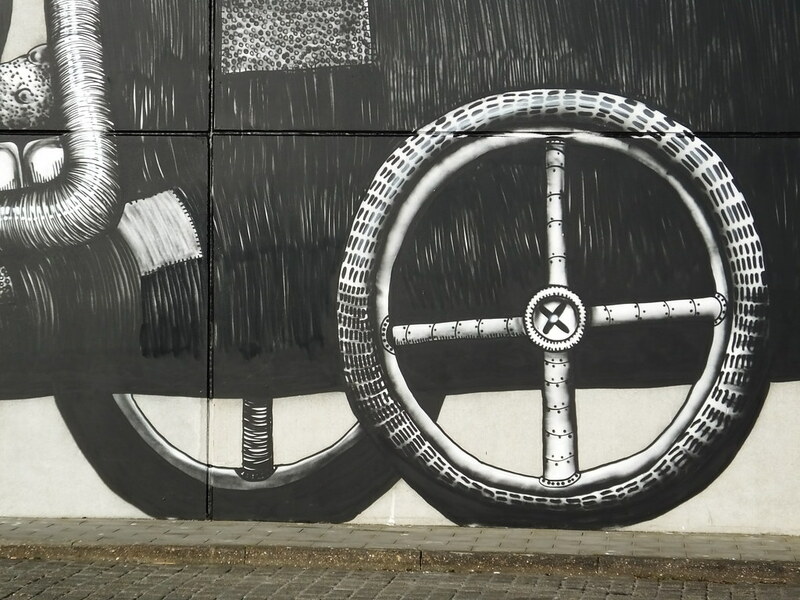 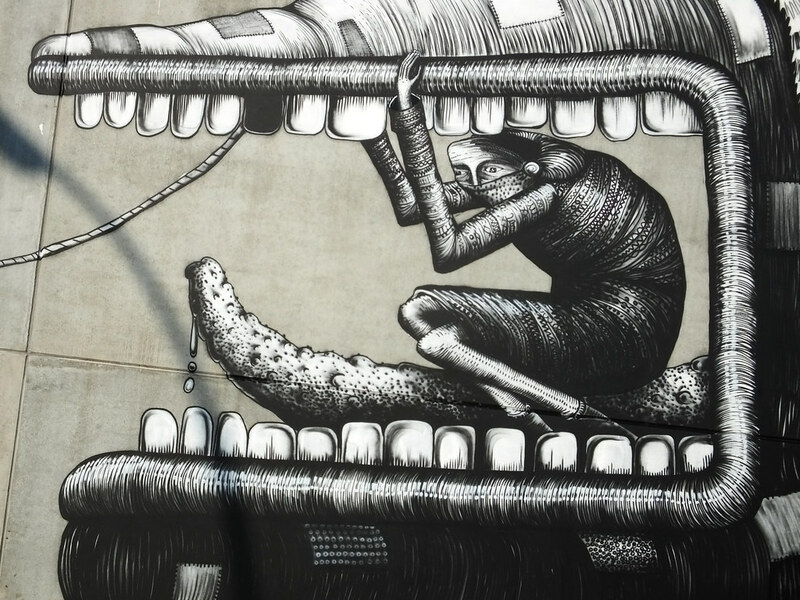 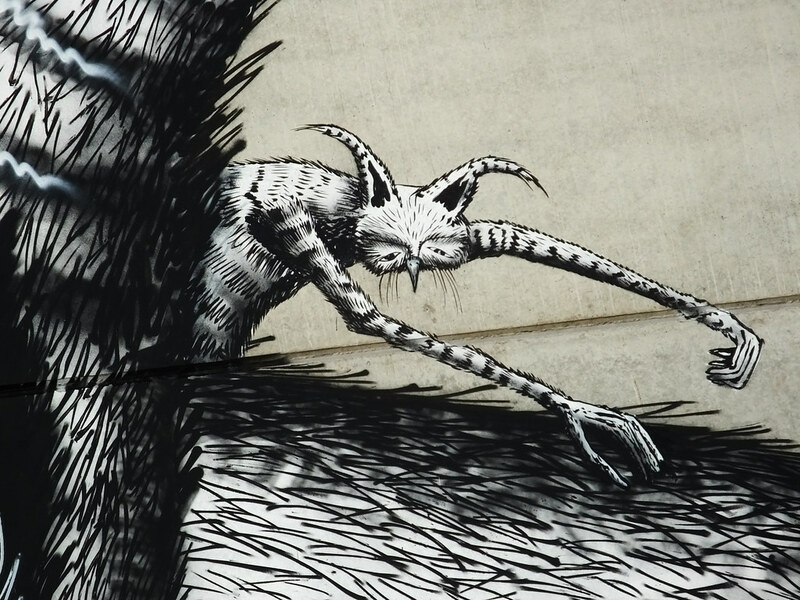 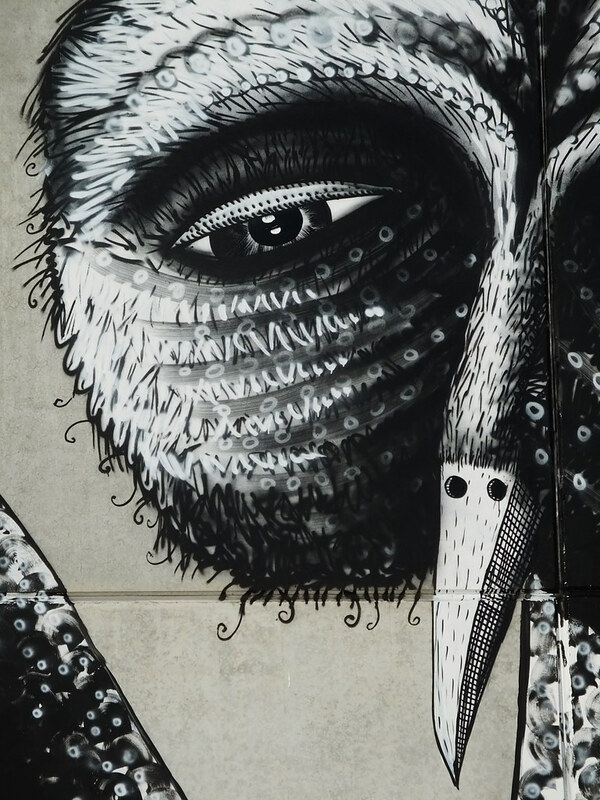 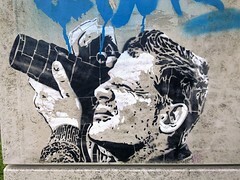 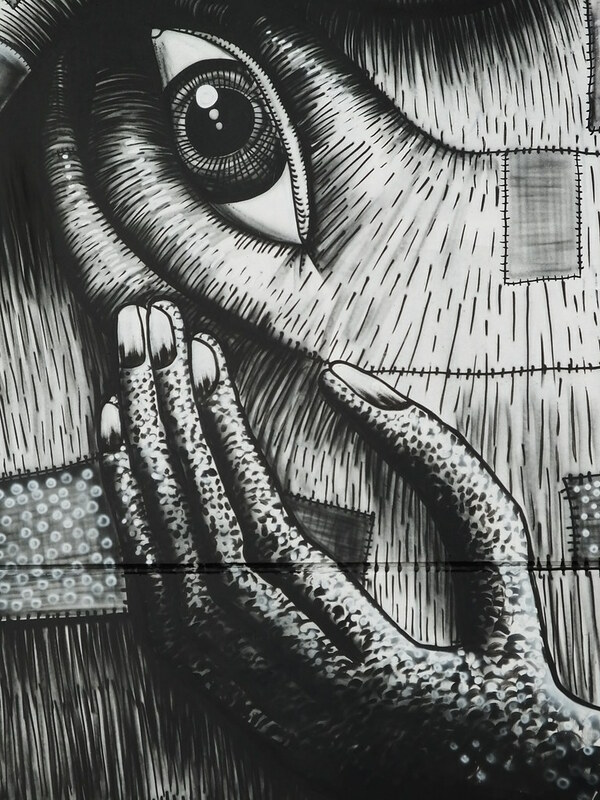 The large concrete canvas was soon covered by Phlegm’s trademark black and white fantastical storyline featuring his eerie, but endearing cast of detailed characters. 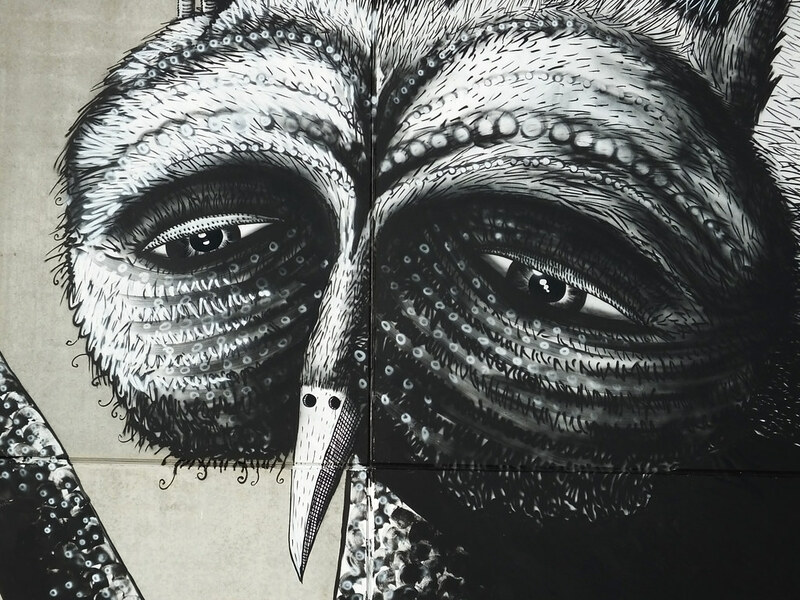 Featured to the right hand side was a rather large character with amazing eyes – just look at all that detail! 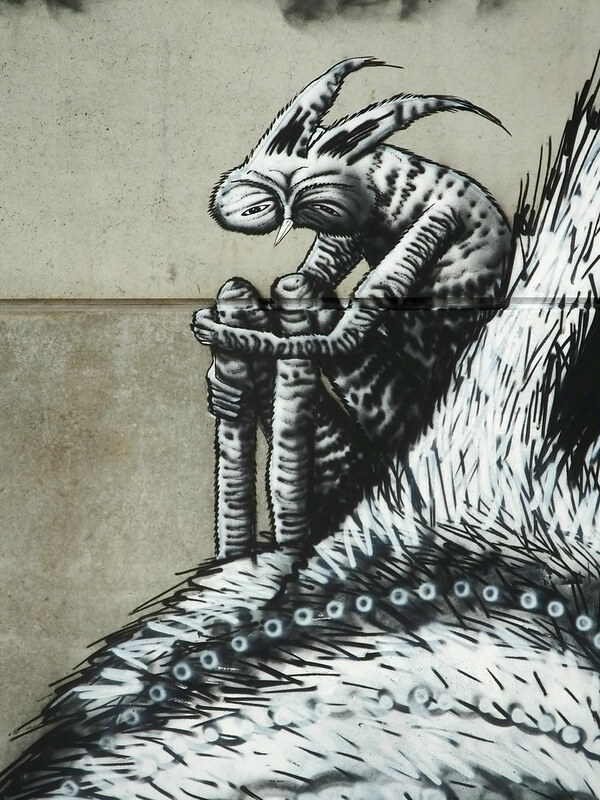 And look even closer and you can spot some more smaller creatures hiding on it’s head too. 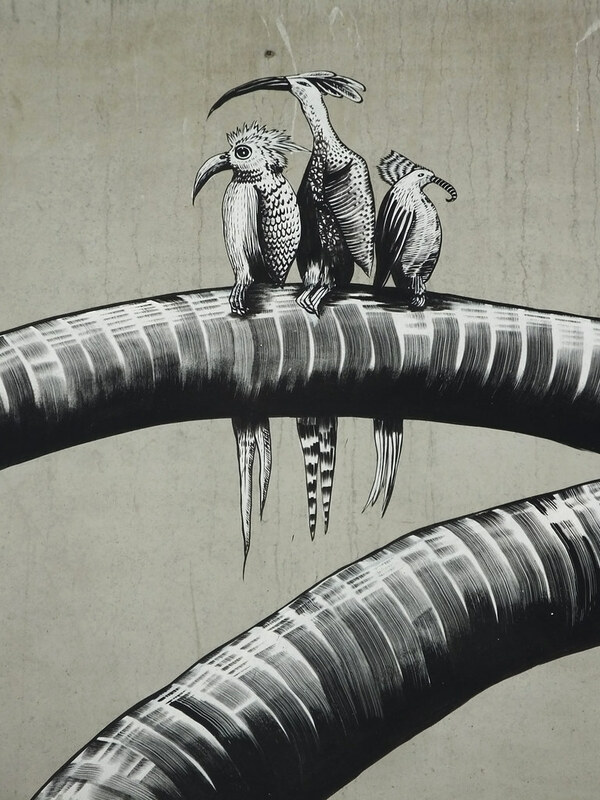 Just what on earth is going on? 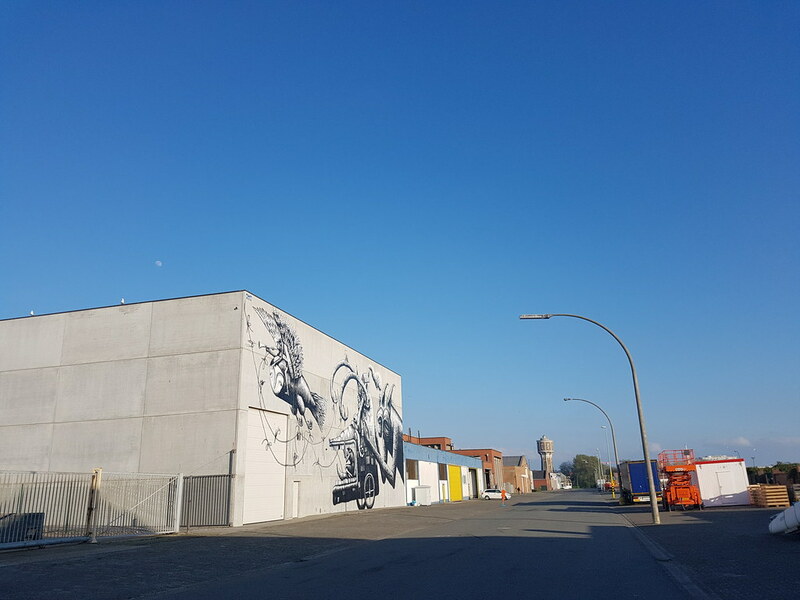 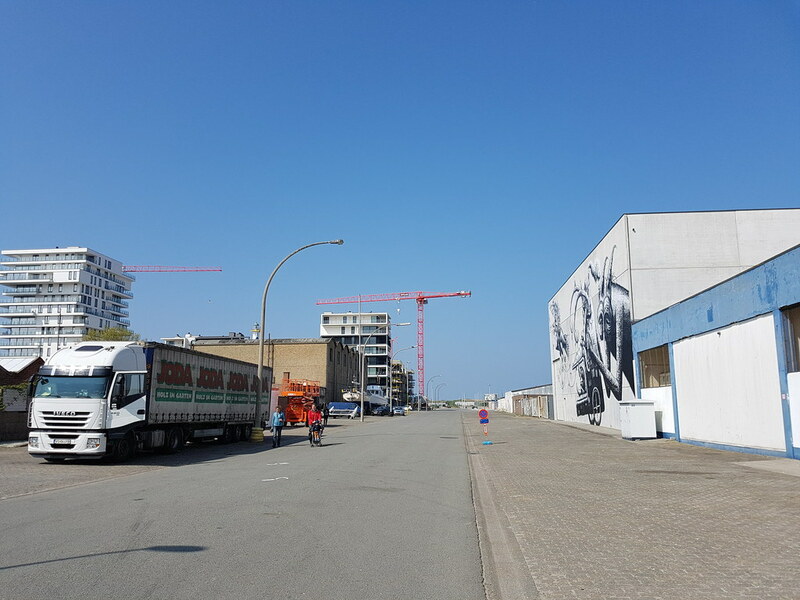 Such an interesting part of Ostend with lots of different shapes and colours all around but this blend of street art and illustration suitably adds to the area. 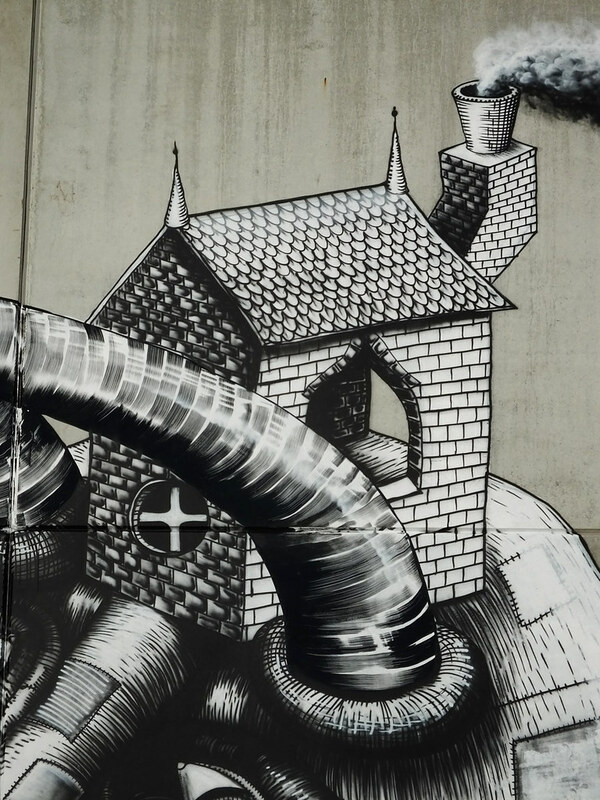 Featured in the centre of the pieces was a character trapped in the mouth of a contraption whilst a cloud of smoke emerged from it’s chimney. 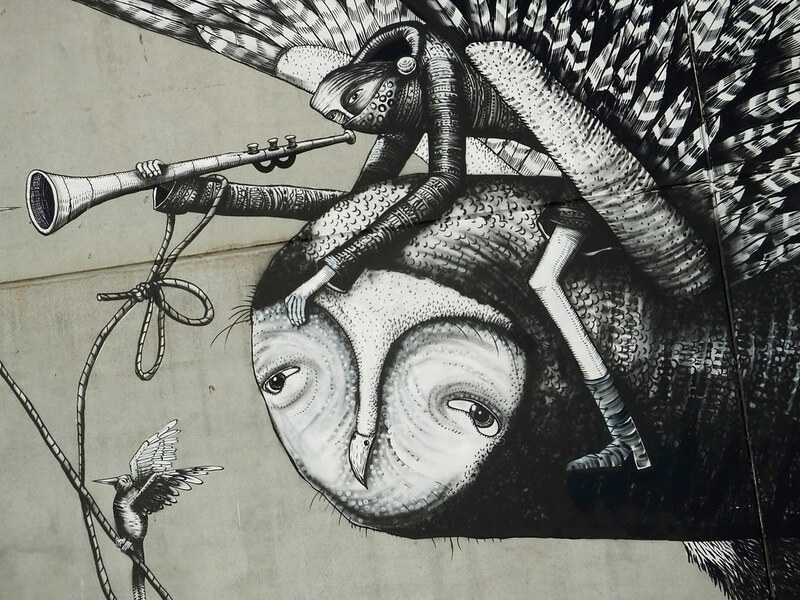 Once again some small extra characters here in the shape of bird-like creatures admiring Phlegm’s work – whilst other feed on some fish! 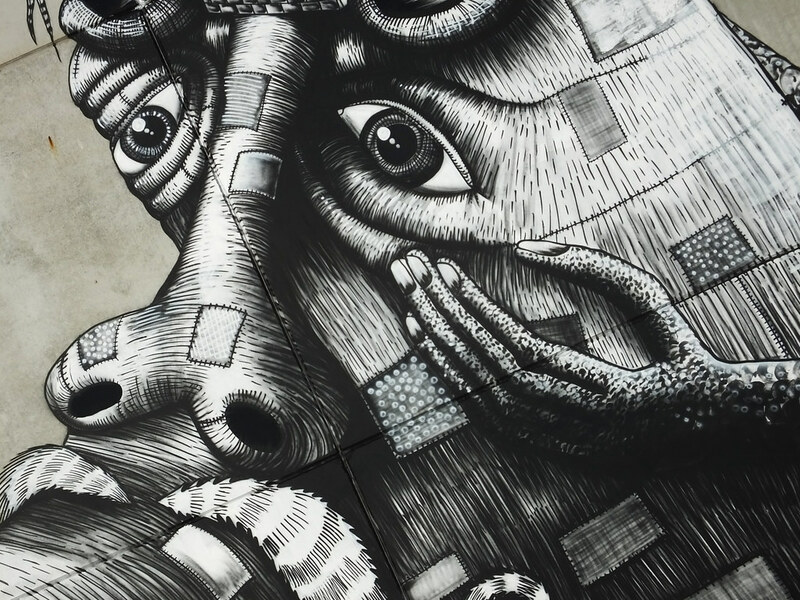 Every aspect of Phlegm’s work was totally stunning, mesmerising and draws you in to just keep staring and see new detail on each viewing. 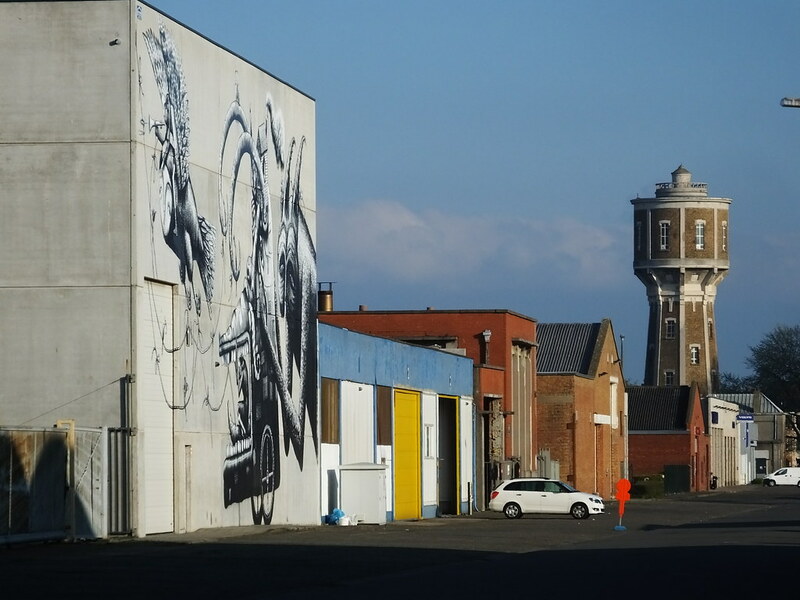 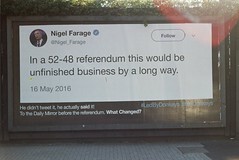 I caught this one three times whilst in Ostend. 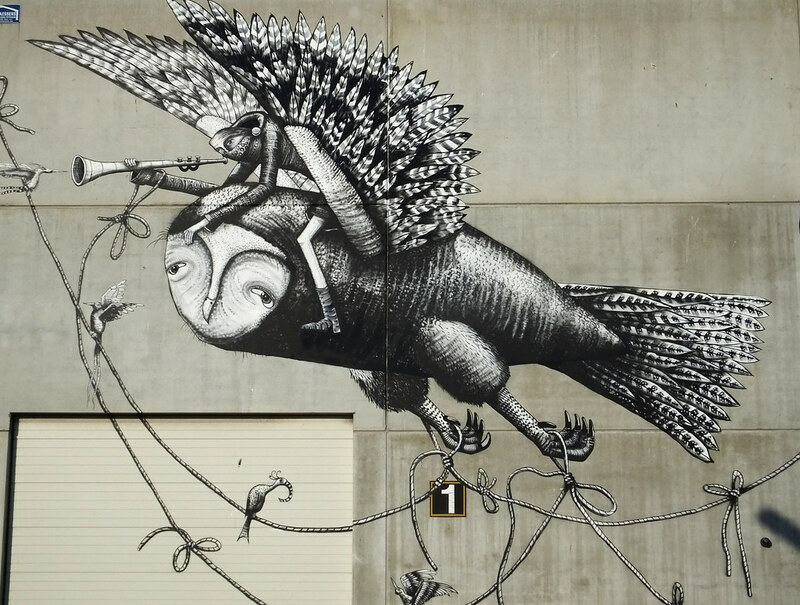 And finally on the left hand side of the masterpiece was a character catching a ride on this flying bird-like creature. 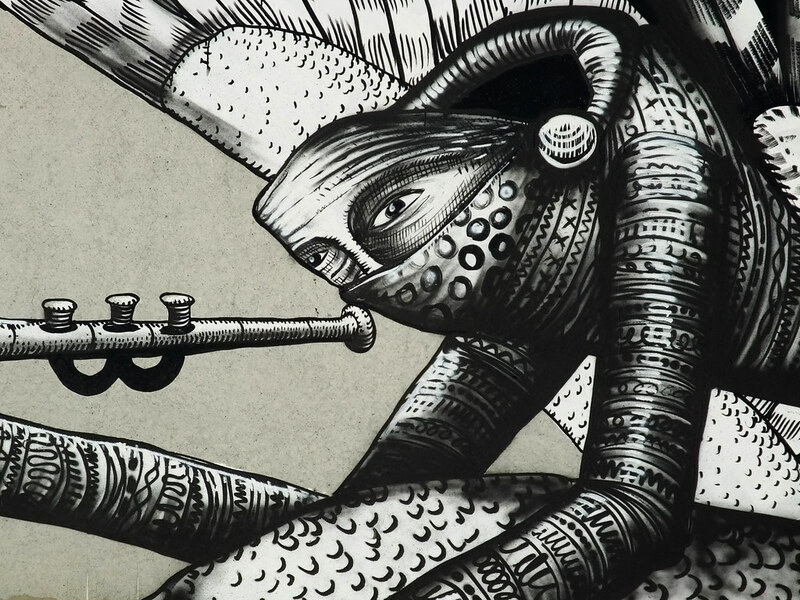 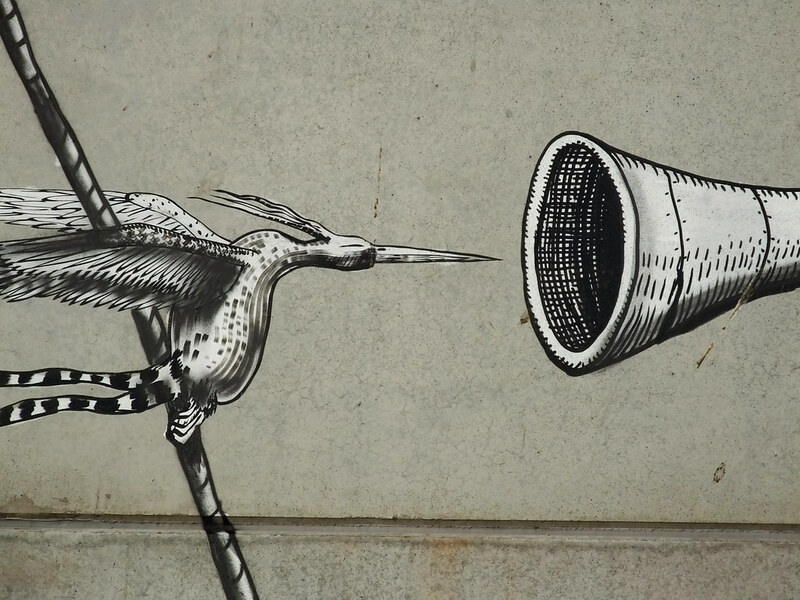 And once again some close up detail of that trumpet blower and a bird-like creature at the end of that trumpet. 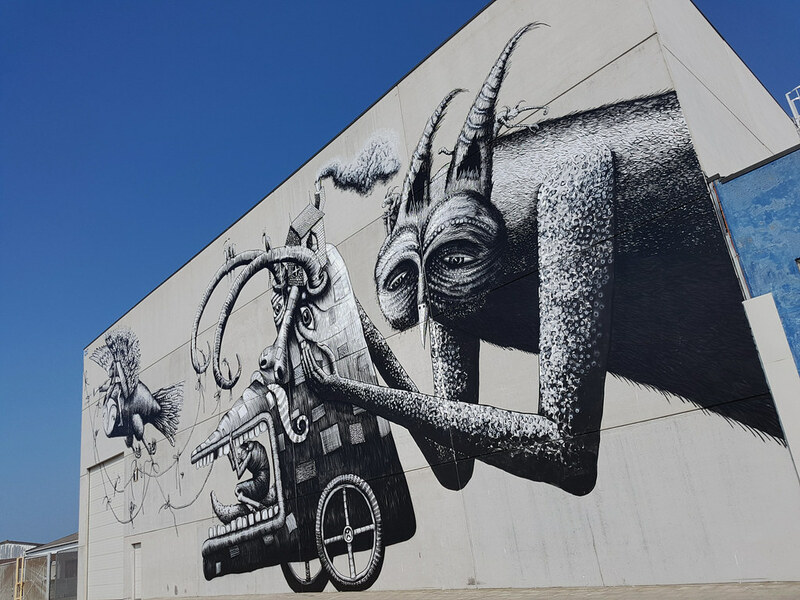 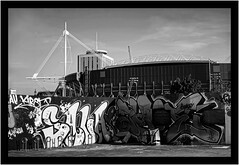 All totally stunning and well worth a visit to see all the great street art that The Crystal Ship event has attracted to Ostend – who also caught him painting this beauty. 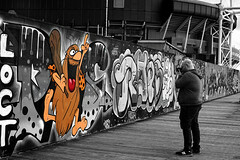 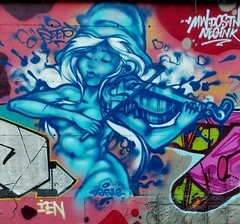 Next Post IS IT ART?